It’s a big fat hairy deal when I lose yet another bet to my best friend, Rena. Not only do I end up attending Bigfoot meetings with her kooky Aunt Phyllis, I find myself traveling with a band of reality TV, Sasquatch-hunting nut-jobs! Not to mention a suspiciously shady film crew. As if those little nuggets weren’t enough to send me on the express-train to Crazytown…I stupidly swore off men! Review: I was immediately attracted by the funny cover when I saw it. I was sure I was going to have a good time with it. Kristy is really unlucky whatever it’s with love stories or even with all the bets she makes. And I must say that this rubbish is reflected daily in her life. The latest? A bet about David Hasselhoff and the fact that he is a star in France, lost as he is in Germany. The consequences? She must accompany the aunt of her best friend: Rena , to some meetings for the Big Foot’s believers. Yes yes, you read that right, and I must say that it’s a really diverse group. Another bet? Since her last break up with a cop, Kristy is determined not to fall for another officer. But it’s finally more complicated than expected. But when Rena bets that she won’t succumb to the charms of the Jake’s friend (the actual Rena’s boyfriend), Kristy is determined to resist. Especially losing it, means eating for two weeks with the two most evil women and losing a card she would love to have. Yet her resolutions will quickly falter when she meets Mitch, the DEA agent who is the most awesome man she’s ever met. She knows that her determination will be put at stake. But a relationship with this man is far from easy, especially when he starts to hide certain truths from her. And on top of that, yes , because it’s not all, our heroine will be shipped in a hunt to find Big Foot , which could make her change her mind about her life. The story was really fun and I was eager to see how would change the relationship between Mitch and our dear Kristy. Especially given the thunderbolt they each have. Yet we understand the reservations of our heroine, especially when this mysterious man refuses to reveal everything about him and that his work won’t ever allow him to stay in one place for long. I loved to see them together, they both form a pretty pair and Kristy is always hilarious when she talks with him. There will be some nice surprises in the novel that I had not planned but I admit I still have a little flat note: the fact that the history between Kristy and Mitch was too fast. They love each other in a few hours and it’s not really credible. I confess that it was a little hard to imagine that it could exist. The search for Big Foot was very interesting, especially to see how many people would able to try to find this mythical creature even if this search is sometimes a bit too long. It was a very enjoyable read that I enjoyed very much to discover. And I confess that I am now curious to read other books by the author. Perfect if you want something light. 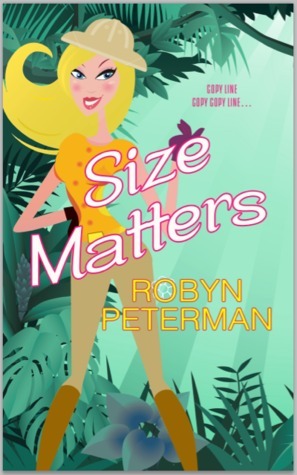 This entry was posted in Chick-Lit, Robyn Peterman. Bookmark the permalink. The cover does look fun and the story seems light, something I can get into. Speaking of Big Foot, there’s a new ridiculous reality show about a bunch of peeps hunting for him. Maybe the characters here have better luck in finding him. I follow Robyn on Facebook and I know how funny she can be, but I’ve never read a single one of her books. I think it’s about time to change that, and I’m always in the mood for something funny. Well, you know I’m a sucker for these kinds of covers. So glad it was a light read. Sometimes you really need one of those.